Today's Craft Project Central project is designed by a new guest designer, Karen Hallam. This pretty collection of Easter baskets and treats will welcome your guests to the table for your brunch or dinner. 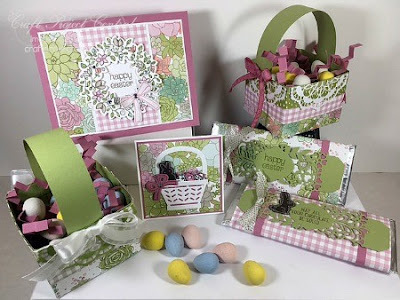 Two options of baskets show off the Succulent Garden Designer Series Paper, as well as the candy wrappers, and table place cards. The Easter card can serve as an invitation or simply a pretty greeting!